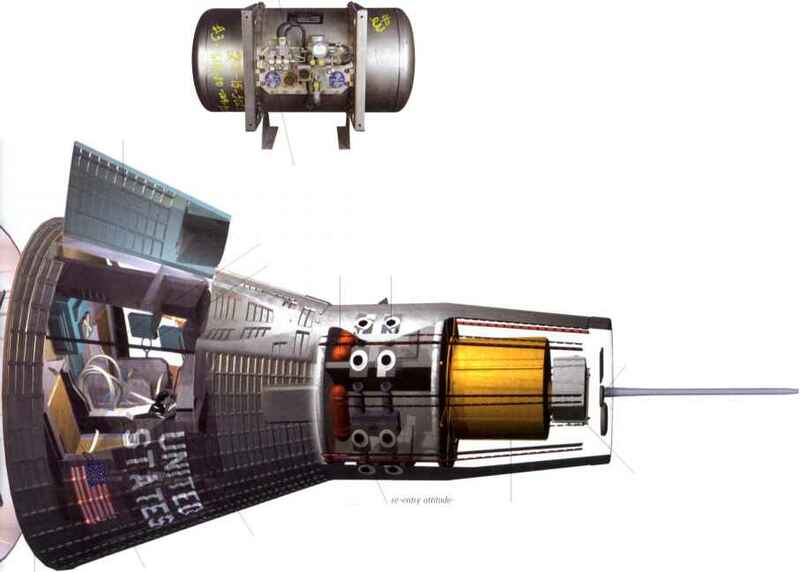 The propulsion equipment for a spacecraft includes tankage to hold the propellant, lines and pressure-regulating equipment, and the engines or thrusters. Common propellants are pressurized gas such as nitrogen, selected monopropellants such as hydrazine, and bipropellants. The pressurized feed systems typically used may be pressure regulated or blow dawn. Important design parameters are the number, orientation, and location of the thrusters; the thrust level; and the amount of impulse required. Chapter 17 discusses the design of propulsion subsystems and characteristics of propulsion components. The propulsion tanks rest at or near the spacecraft's center of mass to avoid shifting of the center of mass as the propellant is used. Engines for translational control are aligned to thrust through the center of mass, whereas engines for attitude control thrust tangentially and are mounted as far away from the center of mass as possible to increase the lever arm and thus increase die torque per unit thrust Attitude control engines which fire in the direction of flight (along or in opposition to the velocity vector) are generally used in pairs to produce a pure torque without net linear force. However, the spacecraft flight path is less sensitive to thrust at right angles to the velocity vector and single attitude control engines are sometimes used in these directions. Three-axis control requires a minimum of 6 attitude control thrusters, and many designs use 8 to 12 plus backup units for reliability. Table 10-12 gives weight and power estimates for the propulsion subsystem. Chapter 17 gives more detailed weights and Sec. 10.6 offers examples of integrated designs. The propulsion subsystem does not use much electrical power unless it employs thrusters with heated catalyst beds, heated thrusters, or electric propulsion. Electric propulsion is rare, but heated thrusters are common. Propulsion lines and tanks must be protected from freezing, usually by thermostatically controlled guard heaters. Power for these heaters is included in die thermal subsystem. Electrically operated solenoid valves control propellant flow to the thrusters, but we account for their power in the ADC subsystem. TABLE 10-12. Weight and Power Budget for Propulsion Subsystem. See Sec. 17.4 for specific design information.